Aviation Updates Philippines - A British Aerospace BAe 146-200 aircraft, with registry RP-C3855, overran the runway in Siargao at 11:25 AM on Tuesday. All 73 passengers from Manila were evacuated safely from the area while the aircraft only received minor damages. SKYJET MISHAP. Authorities are currently investigating what caused the incident on Tuesday. Photo by Del Carmen Municipal Disaster Risk Reduction Management Office. 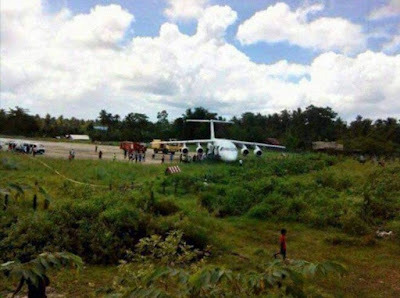 Operations at Sayak Airport in Siargao were disrupted for a while due to the incident. Flights were cancelled due to the disabled aircraft on the runway. The return flight was cancelled as flight M8-421 rested at the end of the runway for hours. Initial reports state that the aircraft rested on soft ground 30 meters from the runway end. It was also said that the pilot attempted to evade an eagle while it was performing its normal landing routines; thus, resulting to the mishap. Aviation news website The Aviation Herald said that two birds were found dead on the runway. In an interview with The Manila Bulletin on Wednesday, Caraga Region CAAP Area Manager Evangeline F. Dava said the airport has already resumed its operations. “The operation here is already back to normal as flights coming in and out from this airport have already resumed,” said Ms. Dava, in phone interview with The Manila Bulletin. The investigation, which is currently being spearheaded by authorities from the Civil Aviation Authority of the Philippines, is still on-going as of writing.